Also known as attitude indicator. A gyro-operated flight instrument that indicates the attitude of an aircraft or spacecraft with respect to a reference coordinate system. Any gyro-operated instrument that indicates attitude. i. A gyro-operated flight instrument that indicates the attitude of an aircraft or spacecraft with respect to a reference coordinate system throughout 360° of rotation about each axis of the craft. This instrument is similar to the artificial horizon but has greater angular indication. ii. Broadly, any gyro-operated instrument that indicates attitude. See artificial horizon. In other words, you can't rearrange them, plus the D10A must be placed where the previous round-gauge attitude gyro was installed. We were in solid IMC with a bad RMI and a failing attitude gyro in an airframe with no backup. The Contractor shall ensure the repair services for attitude gyro, gyro, electric motor and starter assembly attitude gyro WS CH53G/GS/GE, Sea King Mk 41 and Mk 88 A Sea Lynx. The attitude gyro indicated we were 50-degrees right wing down and 15 to 20 degrees nose down, while the IVSI showed us descending at 1,500 to 2,000 fpm with radalt passing 200 feet. The pilots then noted the attitude gyro indicating 10 to 15 degrees right wing down and tried to level the aircraft and add power. My vacuum attitude gyro failed once right after I bought the plane probably because the last owner did not fly much. What's so bad about vacuum systems? The next step in the all-electric upgrade includes selecting an electric attitude gyro. Some trivia: Even a perfect, rotating-mass, attitude gyro without any drift whatsoever still wouldn't maintain a stable attitude indication with time. Except for the rate-based KAP140, most vintage and newer BendixKing autopilot systems require the KI256 or KI258 vacuum-driven attitude gyro. Good thing you have a backup attitude gyro you can switch your peepers to while you sort it all out, right? 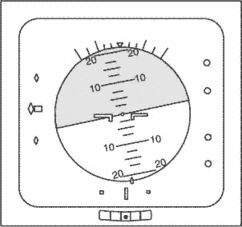 Instrument pilots may remember learning that if they perform a perfectly stable and coordinated 360-degree turn, upon rolling out on the original heading, the attitude gyro will not properly indicate level. This is a solid-state retrofit replacement attitude gyro for the company's venerable King KI-256/ KI-258 air-driven model.